Ok, Ok… I know. You’re saying this time you’ve lost it. Hear me out. The theme of many of the articles that I have written has been that religion is most certainly a man made creation. I believe the evidence in biblical text, for me at least, is clear. The Christian God is a flawed God, particularly in the Old Testament. As I began thinking about how man went about to create a God, IÂ tried to think about how modern day fictional writers would “create” a God. Star Trek came to mind. There are many episodes of the original Star Trek that dealt with God or God-like beings. I think it’s interesting as we look at some of these episodes, how man chose to portray a modernÂ interpretation of what a God-like entityÂ might be like. Chronologically the first episode to portray a “God” was titled, Where No Man Has Gone Before. In short, a crewman on the Enterprise is the victim of an energy field that grants him exponentially stronger telepathic and telekinetic powers as the hours go by. After the accident he grows increasing intolerant of mankind’s comparative weakness. He begins to consider himself a God andÂ many of his human foibles become accentuated by his new found powers. He begins to exhibit the same traits as many of those exhibited by the God of the old testament. He becomes, arrogant, cruel and tormenting. 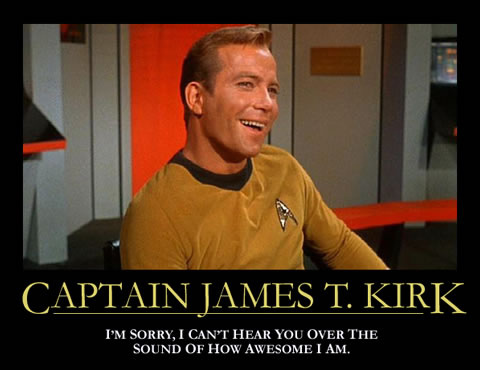 Kirk eventually “takes care of business” before his crewman’s abilities continue to grow beyond their ability to contain him. In this episode mankind is far too immature to deal with supernatural powers of this magnitude. Interestingly, the beings in the next two episodes evolved into their powers over millions of years. The Metrons (Arena) Â and the Organians (Errand of Mercy)Â were powerful beings who used their abilities to bring peace and end violence. With their powers they found there was no reason for the petty behavior they were at one time capable of. They had evolved beyond the need for vengeance or wrathful behavior, a lesson the Christian God never seemed to learn (particularly in the Old Testament). Star Trek is also full of powerful beings that are not so nice, just like the Bible. Wouldn’t a real God, logically act more like a being who is mature and peaceful? If God is all knowing and all powerful what would be the point ofÂ putting people through sickness, infant death, war, pestilence, plague, blight, starvation, etc. I know, we shouldn’t ask what God’s purpose is right? Well… why? Why should it be considered impertinent to ask? Â Why would God have given us brains if we were meant not to use them for problem solving? Science fiction writers come in all shapes and sizes. Some like to write about mean spirited supernatural beings and some write about gentle and loving supernatural beings. That describes the writers of Star Trek, the Old Testament and the New Testament. All three works of fiction. im going to worship capt. kirk,,,,,fun article.